Traveling provides an exciting opportunity to see what the radio band is in another part of the world. While to novices doing a simple bandscan may be a good way to pass the time, for a serious DXer it provides an interesting insight into signal paths, terrain and other related phenomena that dictates how the hobby can exist in areas other than your home. Plus, it gives a DXer an excuse to start a new DX log, so that in itself is a fun aspect of DXing while on vacation. The basis for a good DXing trip involves selecting the best location and equipment needed to receive the most stations possible. In this guide, I will give you some tips from my experience traveling that I feel would bring the most out of a DXing trip. 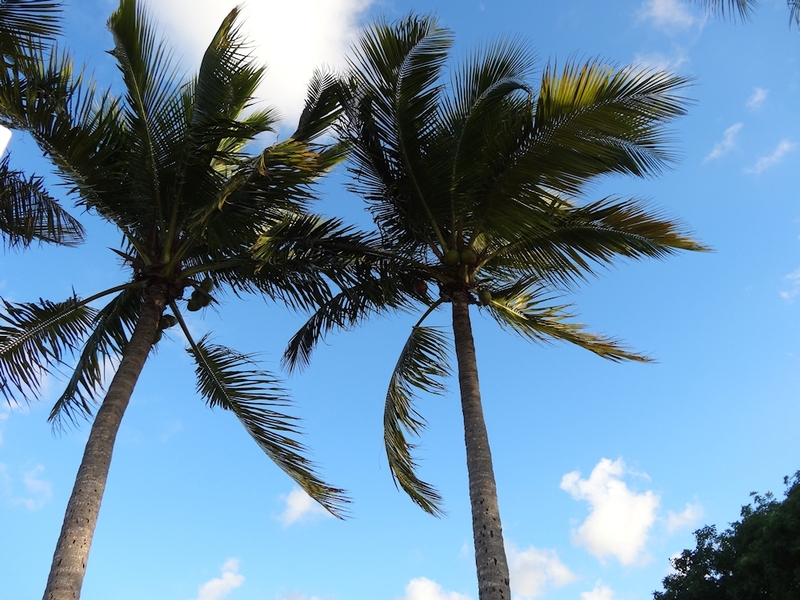 Palm trees taken by me on a vacation to Miami, FL in 2015. Click to enlarge. You may have been asked that question in your travels. Thankfully, the question doesn’t really apply to DXing trips, as you can gain a respectable DX log regardless of why you are traveling. But determining the time and resources allotted to the hobby while out of town can make a major difference in what you receive on the dials. 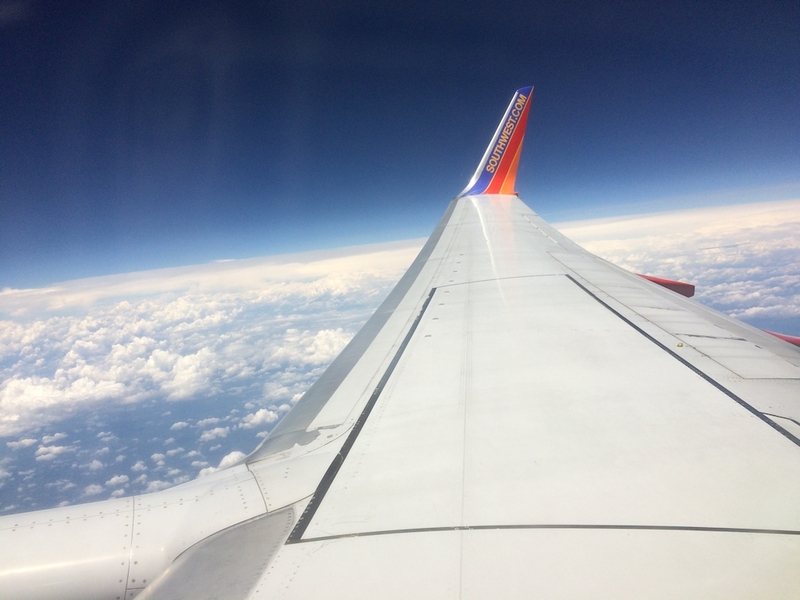 Family vacations – You likely know these all too well. These are the family trips to the beach for a week, or the trip to see your uncle for Thanksgiving. Unless you are lucky and have a DX-friendly family or friends, you will likely not be able to have free reign over the radio, and the time allotted for DXing can be very limited. 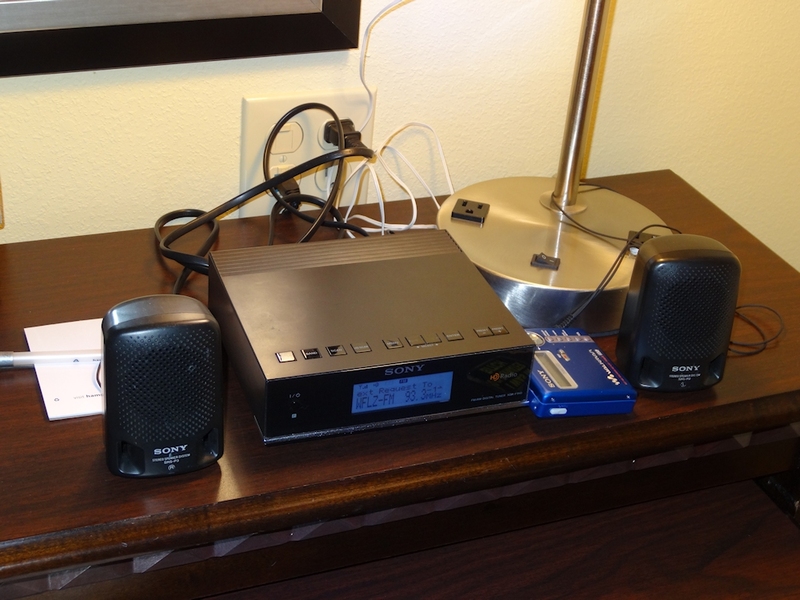 Work trips – Unless you are a workaholic or will be among coworkers at a conference or work site, these trips can actually be very conducive to great DX, as you can easily DX in your hotel room in the evening when signal strengths are likely the best. I once went to Richmond, VA for an all-day seminar for work in 2012 and was able to DX for hours in the evening in my hotel room. Solo trips – By far, these are the best type of trips, as you can do whatever you want, whenever you want. Want to DX all day during a strong Sporadic E opening? Sure, go ahead–the beach will still be there once the opening is done. With solo trips, you are also able to decide on if you will be traveling to another locale to sightsee or DX. For example, my trip to Raleigh, NC in 2015 was chosen simply due to the fact it was far enough away from my home to have a totally different FM dial, and that it was in an area where I often don’t pick up any signals from at home. Bandscans – If you are like me, you often like to stop to stretch out and/or eat while on a road trip. If you are more about 100 miles away from your home or destination, this would be the perfect time to do a dial scan and make a small log of what was received. Including time for HD Radio and RDS screenshots, this type of scan could take 15-20 minutes, just enough time to finish that meal from the highway-exit McDonald’s. A perfect example of one of these one-off logs is my Cheyenne, WY bandscan from 2014. To make the scan go faster (think impatient family members waiting as you listen to static), you can plan ahead and print a list of local signals in the area from Radio-Locator. Full DX logs – These are the type of logs that often cover multiple dial scans, such as over a period of time (i.e. a week) at the same location. If reception conditions are favorable, you could likely get up to 200 stations, or more, during the trip. Example of this type of log is my Myrtle Beach, SC log from 2012. Great, so you are interested in going on a trip. But where are you going? The choice as to where to travel to is largely personal. While I can’t offer suggestions as to specific locations for DXing, I can point you in the right direction. The first thing you should consider when selecting a trip location is what do you want out of the trip. If you are interested in getting HD Radio or RDS decodes, or if you want strong signals, then I would suggest you visit a major city. RadioStationWorld is a great tool to see which stations in the area broadcast IBOC. If you want to maximize the amount of signals that you receive, then a destination between multiple major radio markets (40-50 miles from each one ideally) would be best. 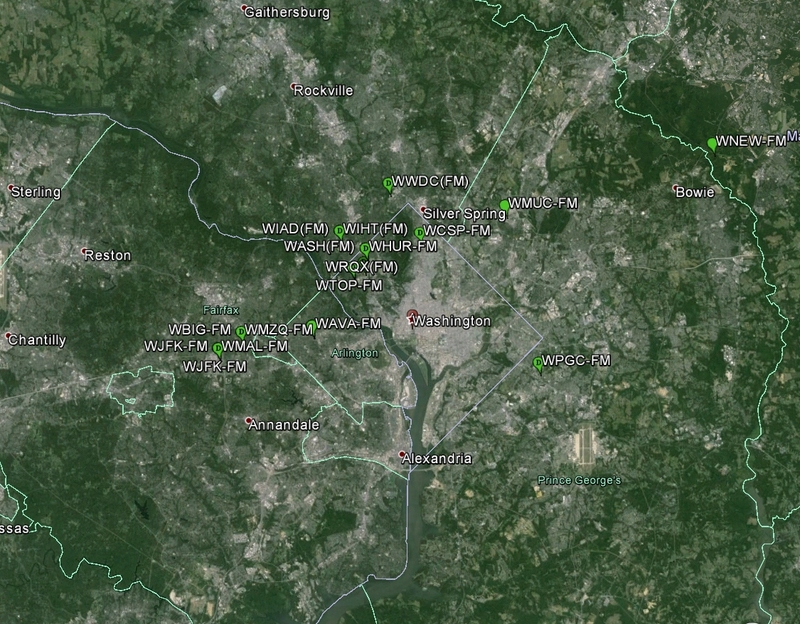 In this picture of the Washington, DC area from Google Earth with the FCCInfo plugin, Alexandria, Reston and Rockville are ideal locations for hotel choices if you want to be at least 8 miles away from the local transmitters. Click to enlarge. Google Earth is a great tool to determine the best location for potential hotels that you could stay in during a DXing trip. The FCCinfo KML plugin for Google Earth plots all FM transmitters and allows you to use Google Earth to determine transmitter distances in the quest to find that perfect hotel. Surprisingly, a hotel in the heart of a city is not always the best place to be for DXing, as the locale’s FM transmitters are often as close to the city center as possible. If the radio you are bringing is HD Radio-capable, I would suggest staying in a hotel within 8-15 miles away from the local transmitters. The same goes for RDS radios. You could stay up to 30 miles away and likely still receive strong decodes, but beyond 15 miles (assuming the local signals are 50kw and below) increases the chance of a station’s much-weaker IBOC signal to not decode. For those who do not have RDS or HD Radio capability in their shacks, you could stay in a hotel much further away from cities with strong FM signals to maximize on loggings, as there is no necessity for a strong signal for HD/RDS decoding purposes. If you only plan on using a car radio for DXing, then there’s really nothing holding you back, as you can simply drive to a more signal-rich area, if needed. The benefit of staying further away from the city center (based on the location of the city’s FM transmitters) means that hotels are often much cheaper and offer better parking options than the hotel in the heart of downtown. 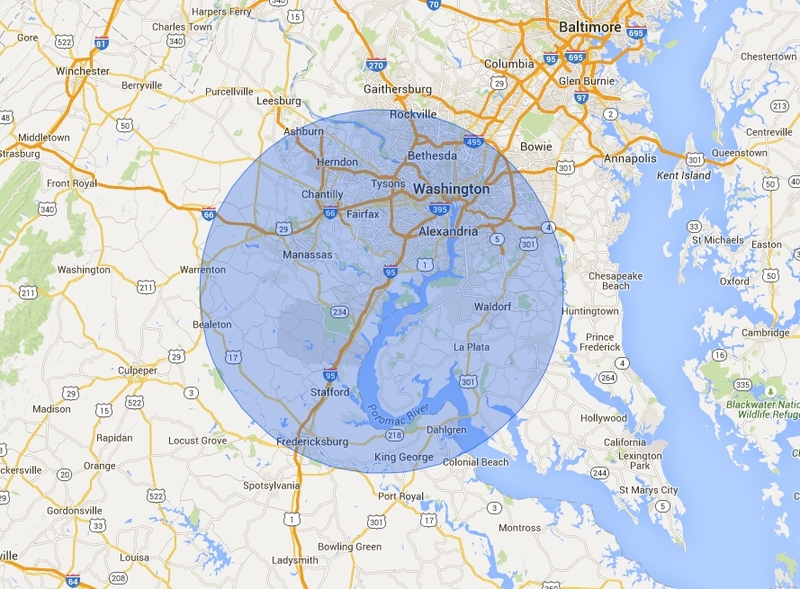 You also need to consider the distance from your home to the area that you want to visit. While everyone has their own limits, I personally will not drive more than 5-7 hours for a road trip, unless I had multiple areas to visit and a lot of time to do so. The How Far Can I Travel website is a great trip planning tool that allows you to put in a timeframe (i.e. 4 hours) or distance (i.e. 200 miles) to see how far you can typically drive from any given point on a map. Being realistic, and understanding that signal conditions vary in one area is important to consider when booking a trip. For example, someone going to Maine in December will likely not get any signals other than locals due to lack of favoring reception conditions at that time of year in the U.S. northeast. At the same time, a trip to an area that is known to receive strong signals from distant stations (i.e. areas along the Gulf coast in the south where tropo ducts can bring in stations over 1000 miles away) does not guarantee that you will get anything but local signals, even during the best times of the year. I’ve traveled to the Tampa, FL area multiple times since 1999 and although I have received signals in via tropo over 450 miles away, the majority of my nights in the area only netted signals within 70-120 miles away. The method by which you travel has a large impact on the type of trip you will experience, in terms of DXing. Each travel method has its own pros and cons. Trips where you arrive at your destination via plane offer the most flexibility in terms of location and “exoticness” of potential trip DX logs, since you can DX literally anywhere on Earth accessible by an airport. However, you are severely limited as to what type of DXing equipment you can bring with you. Flights can afford unlimited locations to DX in. Click to enlarge. The Transportation Security Administration, as well as individual airlines, dictates what can, and cannot, be brought on airplanes in the United States. According to the TSA website, FM radios are allowed on planes, so you shouldn’t have an issue bringing a radio with you, assuming it fits in your carry-on luggage. I highly advise not putting any radios or related equipment in checked luggage due to threats of theft and damage. I’ve brought the Sony XDR-F1HD with me several times on flights and had no issues. However, be aware that bringing a radio through airport security (especially one with a telescoping antenna) may require additional screening. I’ve had security officials ask to hand-inspect my radios while going through a checkpoint, but it was of least concern when they saw what it was. In other words, bringing a radio is fine on an airplane, but be prepared to allow security officials to examine your equipment. I would advise not bringing any accessories that may raise eyebrows at a checkpoint, such as a homemade antenna. I’d, instead, stick with a dipole as it can be folded up and thrown into a carry-on bag with ease. Train travel offers much more flexibility than flying. Although Amtrak has luggage limits, I had no issues bringing whatever I wanted with me, assuming it could fit into either luggage or a carry-on bag. Plus, the lack of airport-style security at train stations means that you would likely not have to explain to a non-DXing security officer why you have scores of patch cables, scary looking but harmless antennas, or multiple radios like you may have to at an airport. Of course, this doesn’t mean that there is no security–you may need to submit to a bag inspection while on a train. Traveling by car is the best in terms of bringing the best (and largest) radios with you, as your only limits are what your car can hold and what you are able to carry up to your hotel room. Of course, the potential amount of DXing locations for this method of travel is severely less than plane or train travel, unless you don’t mind driving 1000 miles away! Hotels with more than 4 floors often offer the best reception conditions. Click to enlarge. Hotel selection is one of the most important aspects of having a successful DX trip. Choosing the wrong hotel could result in low signal levels (even on locals) or it could mean trying to DX in a high-RF environment, making otherwise-clear FM channels impossible to DX on. I would choose a hotel that has at least 3-4 floors high—the higher the better. Hotels that are on a hill or do not have a hill right behind it (which can block FM signals) are perfect. Hotels that have their furniture arranged so the desk is near the window is also beneficial as to provide a suitable place to put your radio. There is a fine line to meet, however, when selecting a hotel. As previously discussed, you must be close enough to the local FM towers in your destination to receive a good signal, but also you want to be far enough away to receive other FM frequencies to maximize your logbook potential. You can choose the best room for DXing via the Hilton app. Click to enlarge. 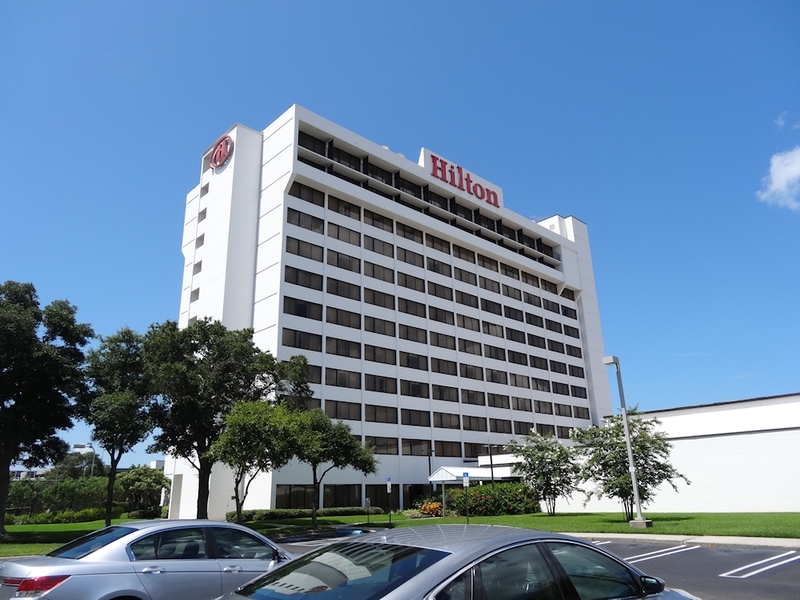 Although I’ve stayed in many different hotel brands, I’ve found that Hilton (and its branded hotels such as Doubletree) are the best fit in terms of DXing, simply because they allow guests to choose exactly which room (and floor) they can stay in via the Hilton cell phone app. I always opt for a room on the top floor of the hotel as close to a corner of the building as possible. (Please note, I have no affiliation whatsoever with Hilton. This is simply a suggestion based on my experience traveling). 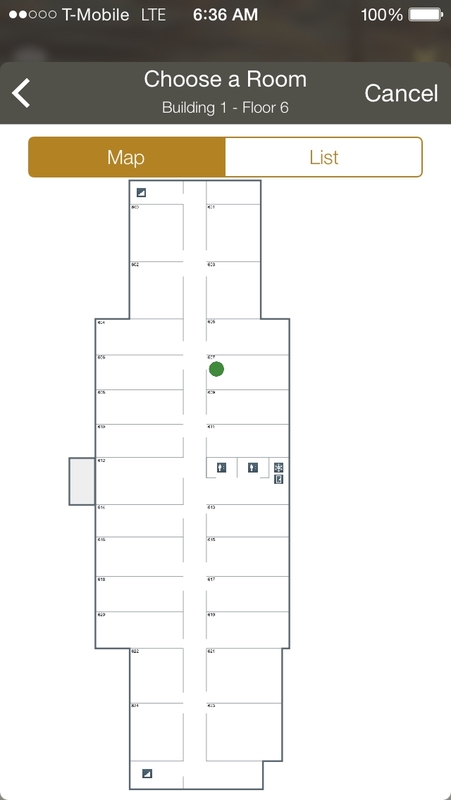 The direction of your hotel room is also important while DXing. Imagine in a hypothetical hotel that the signals that you want to receive are all to the south. If you select a room whose window faces the north, you may not receive these stations at all. But if you chose a southerly-facing room, it could bring in these wanted signals. This is where the Hilton app comes in handy, as it will tell you which direction North is, and you can then determine everything else from that. I have found this phenomenon to not be an issue at beachfront hotels. Since the ocean often acts as a great reflector to signals, room window direction is usually of no importance. Hotel rooms on the top floor of a hotel usually can get signals from all directions as the roof usually blocks less signals than other hotel rooms. If you are stuck in a hotel room that is not facing the ideal direction, in lieu of asking for a new room, you could easily DX near the entrance door or the bathroom of the room, as both are likely closer to the desired side. I have received several FM stations with my dipole antenna against the hotel room door since it was facing another direction than the hotel’s window. My DXing equipment set up in a Florida hotel in 2015. Click to enlarge. Let’s face it—regardless of which transit method you choose, you are still likely to be very limited as to what can be brought on a DXing trip. It is impractical to bring an entire DX shack with you on a trip. The best radios to DX with are likely not suitable for traveling, either, due to size and (likely) risk of damage in transit. So, what do you bring with you? Up until 2017, I brought the Sony XDR-F1HD, or similar radios, with me on trips, as seen on the picture to the left. While this is a suitable setup, it can be very clunky. As of 2017, I now only bring the Airspy R2 SDR radio for RDS decoding/general DXing, the Insignia NS-RAD2 and Insignia NS-HD01 for HD Radio decoding. These radios are much smaller than the XDR radio and can easily fit in a carry-on bag. You also need to make sure that you don’t forget to pack an antenna. Although I could go all-out with a small yagi antenna on road trips, I typically always just bring simple rabbit ears or dipole antennas with me on all trips, regardless of if its via plane, train or car. When in a high location with favorable conditions, reception conditions with a dipole can be fantastic. I once received stations over 500 miles away via tropo using the dipole supplied with the XDR-F1HD. But how do you orient the antenna, especially if it is a dipole? Using a small piece of masking tape on each end, I often tape my dipole to either the corner walls of the hotel room closer to the window, or the window itself. I often move the antenna during DXing as moving the dipole slightly could result in a completely different selection of non-local signals. I recommend using masking tape to temporarily tape dipole wires to hotel room walls as it often doesn’t pull paint or finishes off of the wall (be sure to re-tape at least once every day to another spot to be safe). Don’t forget to print a list of local radio stations at your destination from Radio-Locator. Using GPS coordinates, you could find the exact distance to any station in the world via the spreadsheets available at DXFM.com (please note the spreadsheets are slightly outdated). The right rental car choice can make a difference as to what you can DX. 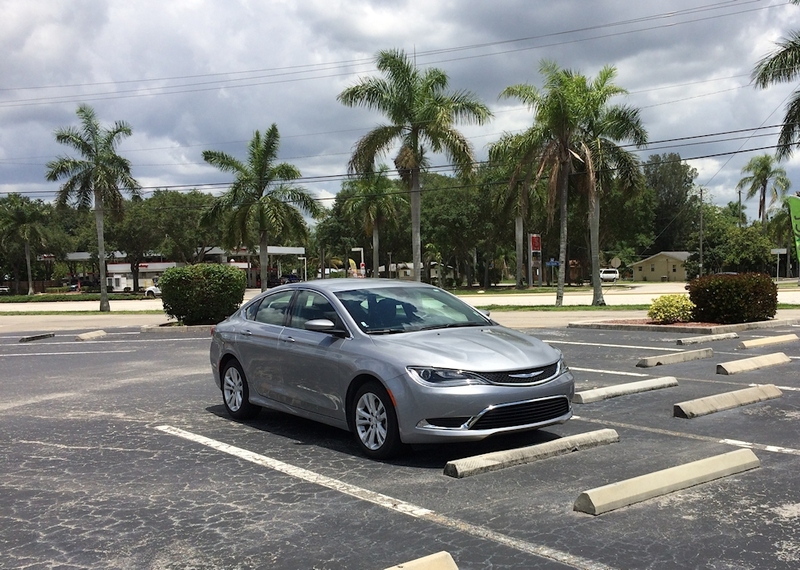 I drove the above Chrysler 200 rental car during my 2015 Florida trip. The car had RDS capabilities but no HD Radio. Click to enlarge. One thing to keep in mind while traveling is that you aren’t limited to what your hotel radio can pick up. Utilize the radio in your rental car (if you have one) to pick up more signals. But be warned: not all rental car radios are equal. Thankfully, we are at a point in time where most rental cars (at least from the major US companies) are recent and have updated interiors and overall nice radios. Any rental car radio should suffice in terms of picking up distant signals. But what about RDS and HD Radio on rental cars? The good news is that it is possible to have both RDS and/or HD Radio capabilities on a rental car. You just need to know how to get it. Choosing a rental car company that allows you to choose your own car, such as Alamo, is a huge benefit, since you can hand-pick a car with these features, if available. But be warned that you may have to pay extra: a compact or sub-compact car, with the common lowest trim level that rental car companies often use in their fleet, may not have RDS or HD Radio in their vehicles rented at that trim level. Although there’s no guarantee, I’ve found most full-size cars have RDS capabilities, and select premium-level cars have that and HD Radio. What constitutes a new log? Every signal received on a radio within the 30-mile radius around my home, as seen above, can be added to my home DX log. Click to enlarge. Considering you are likely to DX while sitting in traffic on your vacation, you may wonder if a new signal received could be added to your in-progress trip DX log, or not. While everyone has their own rules and there is no right or wrong answer to this dilemma, I consider any signal received within 30 miles of the starting point of any DX log to be eligible for inclusion in the said log. I find that 30 miles is typically at the point where the FM band changes slightly (i.e. new translators popping up) to the point where it would be misrepresenting to include a signal received at a greater distance with the said log. Of course, other areas of the US have different reception conditions. For example, in the Dallas, TX area, the radio band changes little even at 60 miles from the first location that I DXed from, given how most signals are high-power and 100kw. Thus, I included new logs received 60 miles away on my Dallas, TX log. Use your best judgment when determining a distance limit for your travel log. If you start receiving a lot of new stations (under deadband conditions) and you are quite a ways from the starting point of your log, it may be logical to start an entirely new log. Overall, DXing while traveling can be a fun and rewarding addition to the hobby. By selecting the best location, accommodations and equipment will surely make any plans a success.